Cross-border mergers and acquisitions (M&A) can be one of the most intense and chaotic periods a company will ever experience. Finally, mindful executives have a practical guide to execute mergers and acquisitions in the reality of today’s diverse global economy – Cross-Border Mergers and Acquisitions. Whitaker has assembled ten leading experts representing the nine countries where the majority of global M&A activity occurs, who have collectively managed several hundred M&A transactions across dozens of industries. The expert contributors examine mission-critical topics, such as cross-border strategy and deal planning, culture and leadership alignment, integration planning and execution, and unique cross-border M&A transaction scenarios including carve-outs and divestitures. 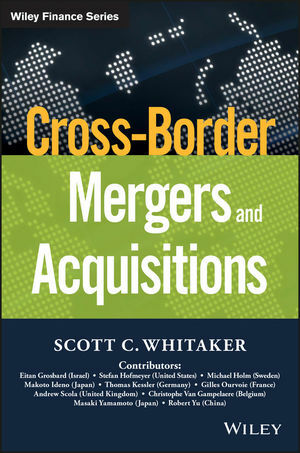 Cross Border Mergers and Acquisitions is a practical toolbox for corporate strategy and development professionals dealing with the many challenges involved in cross border M&A. With a detailed discussion of key market specifics and broadly-applicable critical insight, this book demystifies the cross border M&A process and provides a host of practical tools that ease strategic implementation. A geographical overview explains the trends in major M&A markets including Australia, Brazil, China, Russia, the U.K., and the U.S., and industry-specific guidance covers Financial Services, Aerospace and Defense, Health Care, Tech, Manufacturing, and more. Leading experts relate lessons learned while managing actual PMI (post merger integration) processes, and the discussion of cultural impacts and specific situational needs provides deep insight into the type of leadership a flawless integration requires. Corporate restructuring and internationalization efforts are increasingly relying on cross border mergers and acquisitions. Strategies, motives, and consequences are a complex navigational minefield, but this insightful guide provides solid, actionable guidance for leading a successful integration. Cross border M&A is complex, with myriad challenges and obstacles inherent to the situation. Successful integration and a smooth transition are critical, and there’s little wiggle room—it’s a situation where you have only one chance to get it right. Cross Border Mergers and Acquisitions is an essential guide to the process, with key tools for execution.